Long meter qaṣīda “ ‘Ajibtu li-sa‘yi al-dahr” by Majnūn Layla or Abū Ṣakhr al-Hudhalī. In this episode, we will listen to and analyse three recordings of this qaṣīda, all three composed to the bayyātī maqām. The first recording is of Sheikh Yūsuf al-Manyalāwī, made in 1907 by Gramophone on one side of a 30cm record, order #012707, matrix #1155C. The second recording is of ‘Abd al-Ḥayy Afandī Ḥilmī, made a few months before the above-mentioned recording, by Odeon on one side of a 27cm record, order #45323, matrix #EX1315. 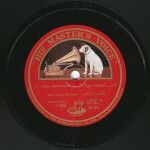 The third recording is of the previous recording’s performer’s nephew, i.e. 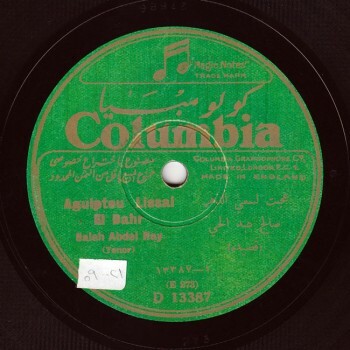 Ṣāliḥ Afandī ‘Abd al-Ḥayy, made at least 15 years after his uncle’s recording, by Polyphon on two sides of a 27cm record, order #V424878a, V42479m, order #3254AR, 3255AR. Let us start our analysis. In his book, Qasṭandī Rizq mentioned that qaṣīda “ ‘Ajibtu li-sa‘yi al-dahri” was sang by ‘Abduh al-Ḥāmūlī. I believe this story, first because it is a long meter qaṣīda, i.e. the same measure of ‘Abduh al-Hāmūlī’s famous qaṣīda “Arāka ‘aṣiyy al-dam‘ ”. Second, because its melodic pattern, which is the same melodic pattern followed in all the recordings in our possession, is very close to the melodic pattern of “Arāka ‘aṣiyy al-dam‘ ”. Moreover, this qaṣīda seems to be a product of the other qaṣīda. Third, because the long meter “fa‘ūlun mafā‘īlu, fa‘ūlun mafā‘īlu” that may be “fa‘ūlun mafā‘īlu, fa‘ūlun mafā‘ilu” most of the time –through ziḥāf, is compatible with “lāzimat al-‘awādhil” (lāzimat dawr al-‘awādhil) that was initially made for the long meter, and that is only compatible with the latter. The rest is fabrication. Thus, all the first qaṣīda initially built to the lāzima (rhyme) of this dawr are long meter qaṣīda. The ṣūfī way and the dhikr ceremonies only perform lāzimat dawr al-‘awādhil to the long meter. Every measure has its own lāzima, but the afandī did not comprehend the concept of one melody for every measure. The poetic rhythm (the rhythm of the word) was segmented following the dawr’s rhythm –the waḥda in this case. In dhikr ceremonies, most qaṣīda are chanted to the then-current waḥda, i.e. 4/4, or 2/4 according to some. This is unimportant. The point is that it is dual in a way or another, and very few are chanted to 3 or 7. Being a Sheikh, Sheikh Yūsuf’s expression requires lyrics because the melody is not sufficient to convey it. In “ ‘Ajibtu li-sa‘yi al-dahr”, he pronounced “Ayy” as if it were an oath, i.e. “Ayy w-Allāh” (he is truly astonished at the passing of time), then went silent, as if he were astonished at the passing of time in general. Then he resumed chanting the qaṣīda. He perfectly understood and expressed in the beginning his astonishment at the passing of time in general, then resumed singing the qaṣīda in an ordinary manner, in compliance with Al-Hudhalī’s, or Majnūn Layla’s –God knows who wrote it–, intention. The point is: he said “ ‘Ajibtu li-sa‘yi al-dahru” then went silent. He did not even continue the core of the verse even though it is the qaṣīda’s first verse that must be recited in full to affirm lāzimat al-‘awādhil. This is exceptional: he said “ ‘Ajibtu li-sa‘yi al-dahri” and went silent. ‘Abd al-Ḥayy Ḥilmī performed the verse’s lāzimat al-‘awādhil with salṭana in a very ordinary manner. Let us listen to the three versions of “ ‘Ajibtu li-sa‘yi al-dahri baynī wa-baynahā” ’s intro. Both ‘Abd al-Ḥayy Ḥilmī and Sheikh Yūsuf al-Manyalāwī tried to fit their performance on one side, and ‘Abd al-Ḥayy’s is shorter than Sheikh Yūsuf’s. 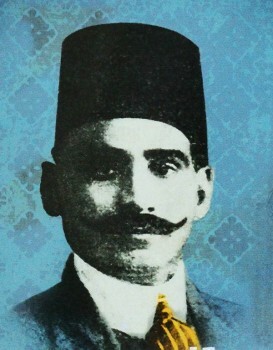 Sāliḥ ‘Abd al-Ḥayy’s performance is more relaxed because he recorded it on two sides, and sang lāzimat dawr al-‘awādhil before the qaṣīda. ‘Abd al-Ḥayy Ḥilmī performed a very small variation in “wa-baynahā”, while Sheikh Yūsuf sang it the first time following the ordinary ‘awādhil qafla as usual. The second time, the conclusion was an open qafla, i.e. “Fa-lammā inqaḍa mā baynanā sakana al-dahru” the first time, then “sakana al-dahru” the second time. Also note that Sheikh Yūsuf sings it faster than the others, because he was used to dhikr ceremonies where qaṣīda reciting is fast. The others dealt with the qaṣīda with a kind of salṭana as if it were a dawr yet whose text is literary and whose melody is not fully fixed. Whereas Sheikh Yūsuf al-Manyalāwī, who was used to dhikr ceremonies, dealt with the qaṣīda as a qaṣīda accompanied by a takht. So the difference resides in the pace and the way the lyrics are dealt with. Sheikh Yūsuf’s lyrics are more precise, even though he said, for example, “bēnī wa-bēnahā” in colloquial Arabic while the two others sang “baynī wa-baynahā” in an ordinary manner –i.e. literary Arabic. Another difference: he says “Layla” (the name) while they pronounce it “Lēla” (night), which implies that each had a different understanding of the language. In “Fa-lammā inqaḍa mā baynanā sakana al-dahru”, Sāliḥ ‘Abd al-Ḥayy slows the pace and goes down gradually, as if time were running fast in the beginning, then slowed down. He expresses with the melody, not with the lyrics. Sheikh Yūsuf concluded “sakana al-dahru” in the following verse “Fa-yā ḥubbahā”. We will listen to his full recording. In “Fa-yā hajra Layla”, Sheikh Yūsuf al-Manyalāwī shifted to the ḥijāz’s fourth –i.e. ḥijāz nawa– in a regulatory, not a shūrī, manner. He stopped right at the ḥijāz nawa, and went back to literary Arabic in “Fa-yā hajra Layla”. ‘Abd al-Ḥayy simply continued with the bayyātī in an ordinary manner, as if affixing lāzimat al-‘awādhil to all other dawr. True to his habit, he did not shift but only performed a mild variation, i.e. he segmented the first five notes of the maqām. We will also listen to his recording in full. Sāliḥ went to the maqām’s fixed position, i.e. the ‘ajam ‘ushayrān scale in “qad balaghta bī al-mada”. In the second hemistich of the verse, he concluded the first side with a very sad qafla, a poignant phrase to the ṣabā then shifted on the other side. We will hear the second side when we listen to the full recording of Sāliḥ ‘Abd al-Ḥayy. Let us listen to this unexpected beautiful ṣabā phrase of Sāliḥ ‘Abd al-Ḥayy, i.e. verse “yā hajra Layla”. Before that, we will listen to Sheikh Yūsuf. Note how each one deals with the verse from his own perspective: Sheikh Yūsuf deals with it joyfully despite the “hajr” (abandonment), while Sāliḥ ‘Abd al-Ḥayy’s version is sad, at least in the qafla of the first side, followed by a more joyful interpretation on the second side. The order of the verses is different “Wa-innī la-ta‘rūnī li-dhikrāki hizzatun, kamā intafaḍa al-‘uṣfūru ballalahu al-qaṭru”. I think the Al-Ḥāmūlī school, represented here by ‘Abd al-Ḥayy Ḥilmī and his nephew Ṣāliḥ ‘Abd al-Ḥayy, decided to place this verse at the end. As written in the book “Al-Aghānī”, it seems that Yūsuf al-Manyalāwī sang “Wa-innī la-ta‘rūnī li-dhikrāki hizzatun” before “A-mā w-al-ladhī abka wa-aḍḥak”. This is unimportant. We will notice this when we listen to the full recordings. ‘Abd al-Ḥayy Ḥilmī started with an ascending note, shifting from the dugam to the bayyātī to the sīkāh. Note that his singing to the sīkāh is very fast. Still, this fast pace did not keep him from reaching the peak of salṭana, at least not in this short side. Let us listen to him. Sheikh Yūsuf also continued to the ḥijāz’s fourth and performed salṭana to the shūrī, he came back as if to the shūrī. When he re-sang “A-mā w-al-ladhī”, he shifted outside the rhythm: “A-mā w-al-ladhī ab/ka wa-aḍ/ḥaka w-al-ladhī” that is clearly deliberate, as if he knew he would be asked to repeat it. Let us listen to it. Note how he shifted back to the jahārkāh as if he were singing to the nakrīz before concluding to the shūrī or the bayyātī in the following verse. Yet, he performed salṭana to the shūrī. Ṣāliḥ Afandī performed salṭana to the jahārkāh / ‘ajam ‘ushayrān, and masterfully went back the scale order in “abka wa-aḍḥaka, w-al-ladhī amāta wa-aḥya w-al-ladhī amruhu al-amru”, conveying crying and laughter, and expressing that he put himself in God’s hands. Let us listen to Ṣāliḥ. In the qafla, Sheikh Yūsuf simply concluded with lāzimat al-‘awadhil in an ordinary manner, as if in a dhikr ceremony, without any surprising element. In verse “Wa-innī la-ta‘rūnī li-dhikrāki hizzatun, kamā intafaḍa al-‘uṣfūru ballalahu al-qaṭru”, Al-Ḥāmūlī school’s ‘Abd al-Ḥayy Ḥilmī and Ṣāliḥ ‘Abd al-Ḥayy postponed “kamā intafaḍa al-‘uṣfūru” for the benefit of “Wa-innī la-ta‘rūnī li-dhikrāki hizzatun”. Note how ‘Abd al-Ḥayy sings it. In “ta‘rūnī hizzatun”, he seems to be expressing with music, with melody. Also, note Ṣāliḥ ‘Abd al-Ḥayy’s conclusion. Let us listen to “kamā intafaḍa al-‘usfūru ballalahu al-qaṭru” and note the way he segments the ‘awadhil. This confirms that the ‘awadhil rhyme was initially made for the long meter. So, let us start listening to the full recordings. 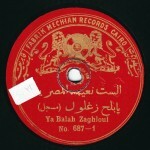 First, the recording made around 1906 by Odeon on one record-side, of ‘Abd al-Ḥayy Ḥilmī accompanied by Ibrāhīm Sahlūn (kamān) and Muḥammad Ibrāhīm (qānūn). All the notes we made will now become clear: lāzimat al-‘awādhil is purely instrumental, followed by a short taqsīma at the end of the disc played by Ibrāhīm Sahlūn who, true to his habit, played an aspect of the ḥijāz’s fifth after the ḥusaynī: playing to the bayyātī then to the ḥijāz’s fifth, not to the ḥijāz’s fourth, i.e. he played to the bayashāhnāz, not the shūrī. Beautiful! Let us listen carefully to the last part. Beautiful, Sī ‘Abd al-Ḥayy! Wow! Now, let us go to the recording made just a few months after this one: Yūsuf al-Manyalāwī did not succeed in getting away from ‘Abduh al-Ḥāmulī’s school. First, because he used the same maqām. He had surely listened a lot to ‘Abduh al-Ḥāmūlī. He tried to add his personal signature, but Al-Ḥāmūlī’s influence remains obvious, added to the mashāyikh’s influence. Sheikh Yūsuf is accompanied by Ibrāhīm Sahlūn (kamān), Muḥammad al-Aqqād (qānūn), ‘Alī ‘Abduh Ṣāliḥ (nāy), and Muḥammad Abū Kāmil al-Raqqāq (riqq). This is the first qaṣīda performed by Yūsuf al-Manyalāwī and recorded by Gramophone that has reached us. 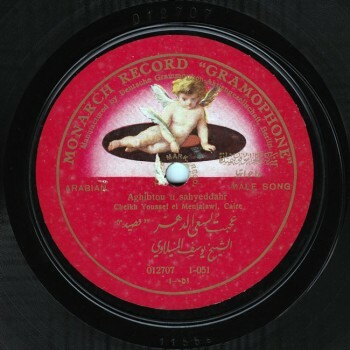 There are two other qaṣīda recorded by Sama‘ al-Mulūk, still this is the first recording of a qaṣīda made by Gramophone in 1907. Unlike most of Sheikh Yūsuf’s qaṣīda that were recorded on two sides, this one was recorded on one side. I repeat this very important point: Sheikh Yūsuf sang the qaṣīda faster than the other two, as if he were in a dhikr ceremony. Also, note the presence of the percussions that is much more significant than in other dawr… another reminder of dhikr ceremonies. Now, the recording made by Polyphon around 1923, of Ṣāliḥ ‘Abd al-Ḥayy accompanied by Sāmī al-Shawwā (violin) and ‘Abd al-Ḥamīd al-Quḍḍābī (qānūn). Ṣāliḥ ‘Abd al-Ḥayy dealt with this piece as if with a dawr. Lāzimat al-‘awādhil is performed instrumentally. Then he sang lāzimat dawr al-‘awādhil “āh yā anā w-ēsh li-el-‘awādhil ‘andinā um maḍya‘ el-‘udhdhāl we-wāṣilnī anā” before entering the qaṣīda. There is a shift to the jahārkāh from the ‘ajam ‘ashīrān and the ṣabā followed by the great sequence we heard and that is linked to the preceding and following sections. With this great recording, we reach the end of today’s episode of “Sama‘ ”.